Now there are some huge problems to overcome for those who fancy themselves out of the box thinkers. One is that there are few, if any human beings, who are able to create a completely new box. The limitations of box building seemed to be understood just a few decades ago, when people seemed to sense that only intellectuals of the highest degree could think about box building. However, because of are fantastic education system and our love for pure knowledge, we can now all build boxes. Maybe, each of us can have our own box? 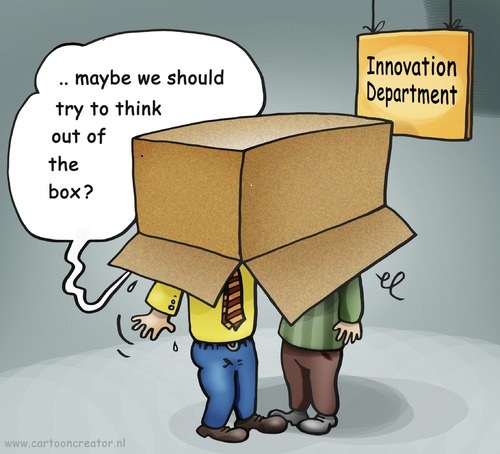 The truth is, that very few are able to know the box that they are in much less create a new one. Box makers are few and far between; they are men like Moses, Plato and Jesus. In fact, most boxes are not made by individual, but by complete cultures over a long period of time with a lot of hard work. What most people mean by “out of the box thinking” is thinking without a foundation of any authority, which in the end simply means giving your own option on a subject with no appeal to an authority outside and other than yourself. One thing that could be said for out of the box thinkers is that in appealing to themselves as the only authority needed, they have saved themselves a lot of laborious study, which is usually required for box building. I should be careful, for if I say too much, some in the educated class might get the idea to hire these out of the box thinkers to teach everyone to build these easy self created boxes. We could even standardize the boxes, We Westerners are good at that, and then our university could mass-produce out of the box thinkers. We could have the loony bin box, the chaos box and the confused box and in this, we could all be different and the same, at the same time. The America dream comes true, everyone in their own box.